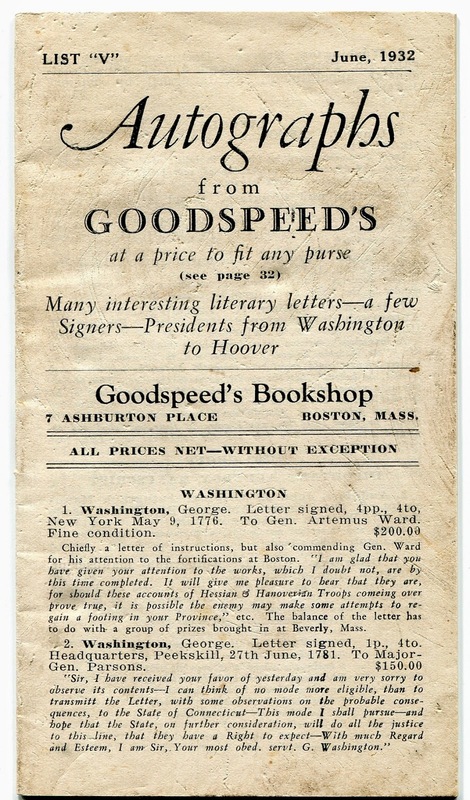 When you thumb through this little catalog from Goodspeed's Boston bookshop, you'll want to load your purse or wallet with wads of cash (no credit cards) and jump in a time machine for a bargain basement shopping spree. 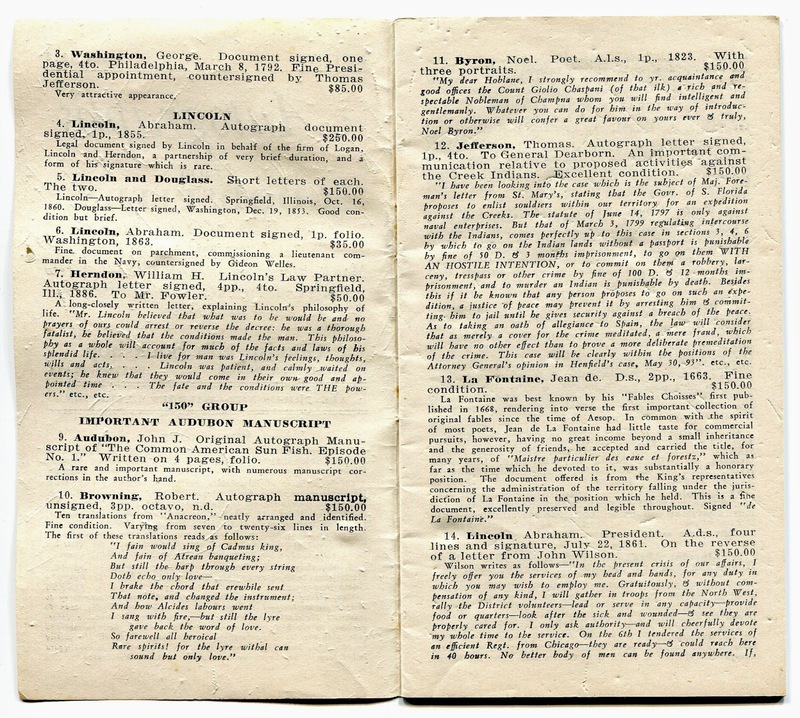 Rare and collectible autographs found in letters and other paper items are for sale at prices that seem ridiculously low even for 1932. 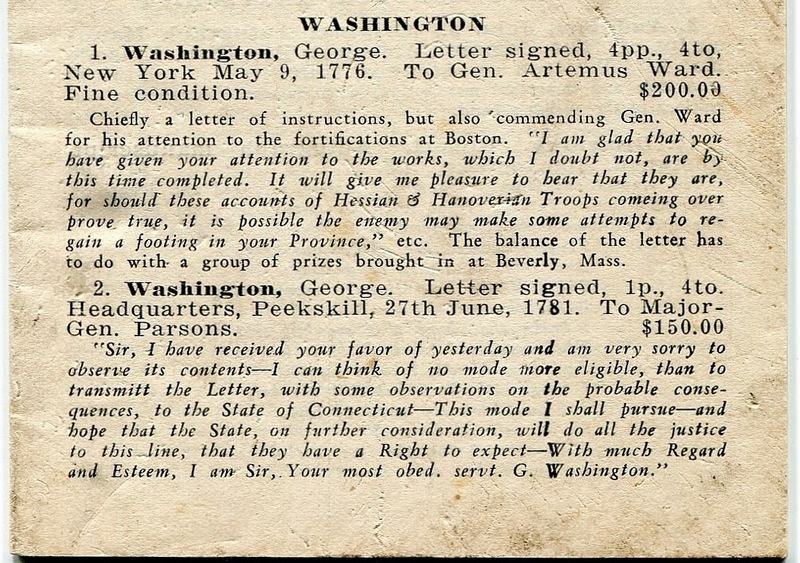 For example, right on the front cover of this booklet, no less an American icon than George Washington is represented by two signed letters (below) for the measly sum of $200 and $150, respectively. How many zeros would be added to the asking price for the same letters offered for sale today? If the above prices are too rich for your blood, how about 85 bucks for a one-page document signed by Washington... and countersigned by Thomas Jefferson. Eighty-five dollars??? Letters from Presidents Madison and Monroe were evidently not as popular with collectors, as their signatures commanded a mere $35. But there's also an Abraham Lincoln signed document for the same price. Other presidents range from $25 to $100: Andrew Jackson, John Quincy Adams, Millard Fillmore, Zachary Taylor, Ulysses S. Grant, James A. Garfield, Theodore Roosevelt, Calvin Coolidge, and Herbert Hoover. And other Lincolns are priced at $100. 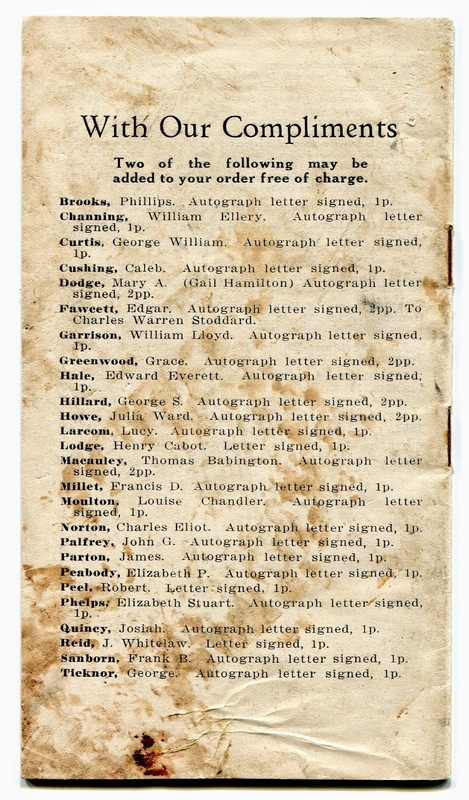 Speaking of Garfield, there's a particular interesting collection of eight signatures that are connected to his assassination: Garfield himself; his assassin, Guiteau; the judge in Guiteau's trial, as well as counsels for defense and prosecution and three surgeons, whom I assume testified in the trial. All yours for $20. 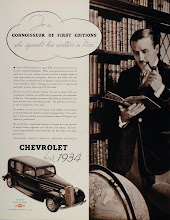 Lest you think only American presidents made the cut for this catalog, there's plenty for the bibliophile also. How about a Charles Dickens letter for $50? 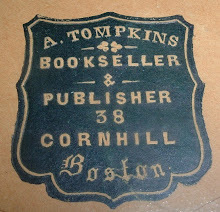 Signatures on letters, envelopes, and checks for James Fenimore Cooper, Washington Irving, and Henry Wadsworth Longfellow were priced in the $5 to $35 range. 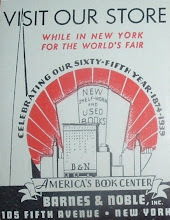 The list of well-known American and British authors goes on and on at prices that just make you shake your head. For classical music lovers, there's even a Franz Liszt full-page Christmas greeting to a friend for $2. Wow. 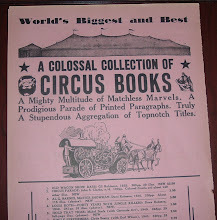 Now, if you bought any of the 303 items listed in this catalog, Goodspeed's would let you add any two items from the back cover with their compliments. For that nice offer of a few freebies, I'd have to travel back to 2014 and google some of those names to help make my selections. Or just accept whatever was available. I would imagine they went pretty fast. And what would I have bought from the catalog? Everything!